Replacement: None. We are no longer carrying this MicroRax Kit in our catalog. This page is for reference only. If you're in the market for a rigid prototyping system, MicroRAX may be just what you're looking for! MicroRAX is a miniature light-weight T-Slot style building system. Suitable for use on your desktop or bench top to build science, engineering, or advanced hobby and DIY projects. MicroRAX works the same way as other slotted framing systems that you may already be familiar with. 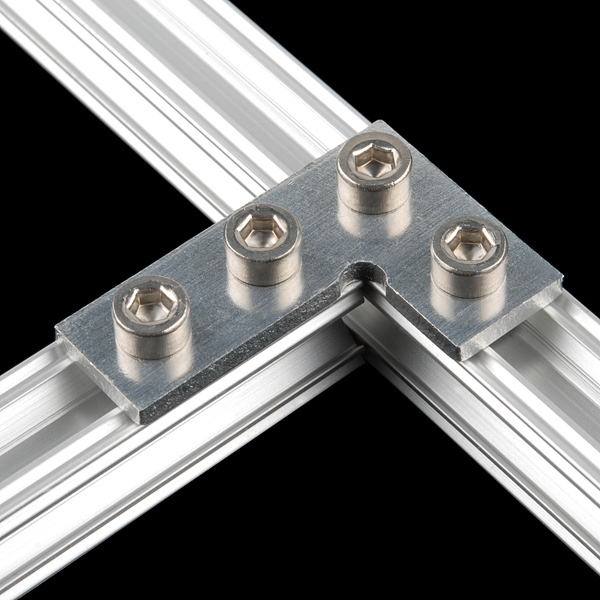 Ten millimeter square beams of high strength extruded aluminum can be joined by bolting through joining plates into nuts that fit into the slotted channels. By using different combinations of joining plates you can make just about any configuration you can think of. Bolts are easy to insert and remove by using the included hex key or your favorite 2.5mm hex driver. 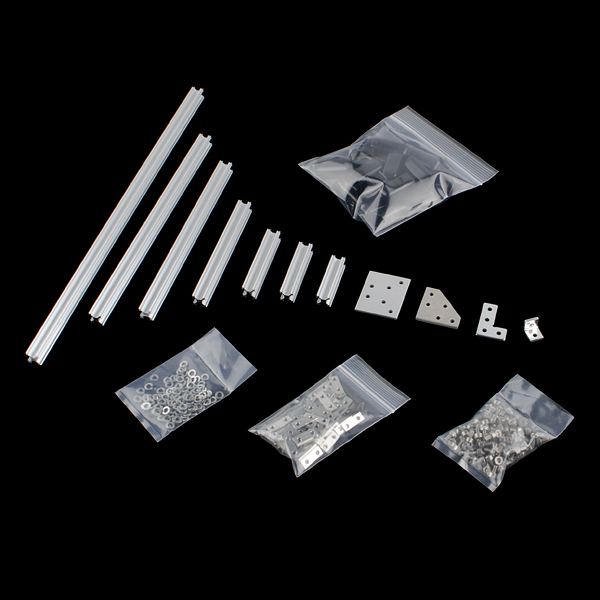 This medium sized kit includes a whole bunch of MicroRAX parts to get you prototyping on your next structural project. Note that the screws are different to the Microrax. I haven't used the Microrax ones. These ones are easy to grip, I think the microrax ones would be fiddly in comparison. My kit arrived yesterday and tonight I got a chance to play with it. Blogged the experience at MauiMakers.com. Some issues with getting nut plates to fit into the slots. Documentation is lacking. Selection here is ok for starter without knowing what I want to build. Look forward to using it on a real project soon. Microrax wiki I started. Gives some useful information on compatible parts (eg: 3mm shafts, etcâ¦) and kit contents and part information. Remmrevnivek, Misumi also sells 20mm square extrusion (a bit cheaper than the Microrax 10mm) and they'll cut to size as well. 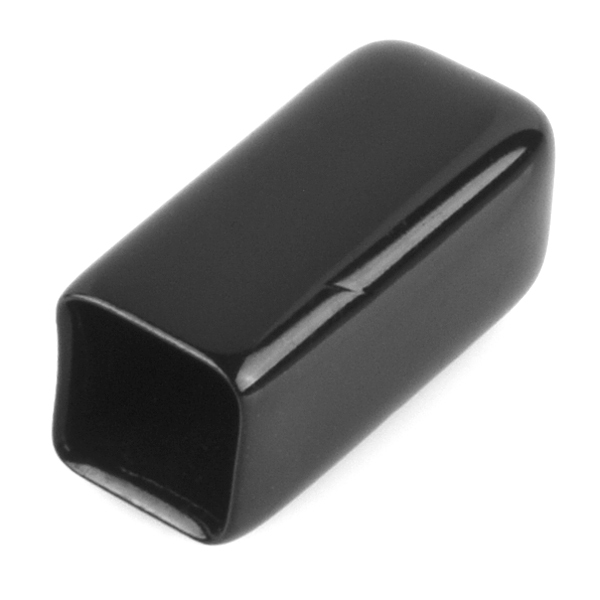 Is Misumi 20mm extrusion compatible with MicroRax 10mm? Thanks for mentioning Mitsumi. It looks like a more capable, and less expensive extrusion system than these MicroRax/Makerbeam things. The Misumi 20mm extrusion is very nice. I'm using it in the construction of a MendelMax. They cut them perfectly, they arrived quickly, and were inexpensive. I've purchased 80/20 off of ebay in the past and my luck has been hit or miss. Some have been total crap, others passable. None have been the quality of Misumi though. YMMV. One of the benefits I can see to this MicroRax kit is that it's all inclusive. I ended up sourcing plates, screws and washers elsewhere, it wasn't expensive, but it was annoying. This looks to be very similar to the Pro Kit direct from Micromax. The description here says that there are 10 right angle brackets, the Pro kit has 8. Other than that, the accessories list is identical. 9m or 30 feet of pre-cut beams. 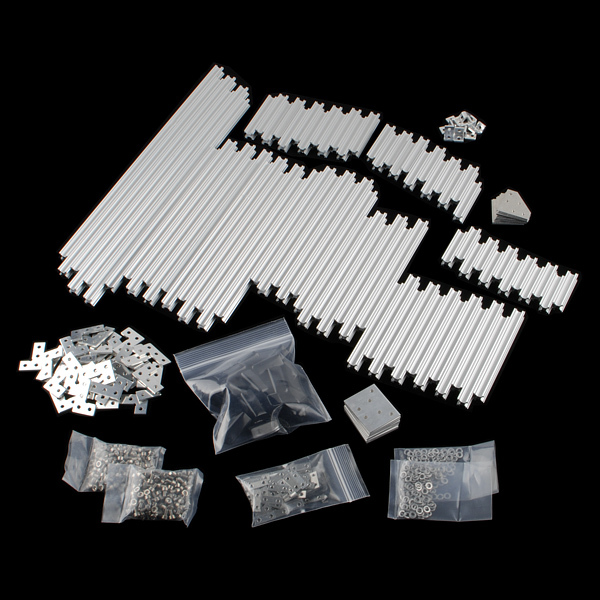 Reasonable assumptions about the cost of the accessories pack and the shipping/markup (total of $100) indicate that these kits are competitively priced per length of extrusion (about $8/m). Based on the fourth picture, these are cut very cleanly and squarely, probably a good deal better than one could do with a hacksaw. Whether you prefer this service or to cut it to whatever lengths you need can determine which version you buy. Also, there are longer/additional extrusions available from the MicroRax site at a rate of $1 per 100mm.